100 cars planned, which accounts for discrepancy in number of trucks ordered, 200 (100 pairs). 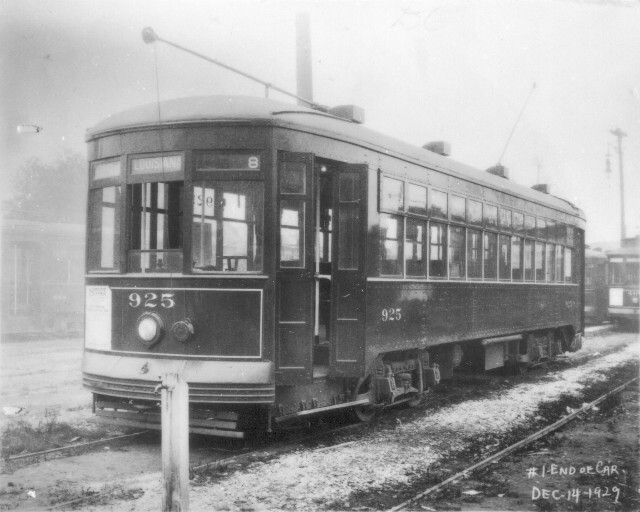 The rest of the trucks used in various RB & RT programs, for Palace cars and Semi Convertibles. The 900s were practically mirror images of the 800s. P + text S pp. 151-158, scale drawings S pp. 154-155. See ERJ v. 67 no. 15 p. 632 - P #906 as deliv. in 1924. RE has several P of 900s under construction at Thomas Car Works. Both the 800s and the 900s used the Providence Lifeguard Fender (the Herr was used for the last time on the 400s - see S p. 150 and ERJ v. XLII, no. 2, p. 74 P FB&D 205 with fender, with text explaining William Dickenson, MM of N. O. Ry. & Lt. developed the device). RE and scale drawings in S have complete details of interior appointments, controls, air systems, even color paint specifications. Note RE mentions 946-949 fitted with GE & WHSE “quick service / relay valves” (1931 ed. ), noting NOPSI “considered the four cars experimental, recently re-equipped by the Rolling Stock and Shops Dept.” See especially entries here for 970. While first substantive RB didn't take place until early 1960s, there were noticeable changes done before that time, with the 800s and 900s both. In early 30s, the white trim between both sashes on side windows reduced to between only lower sash. 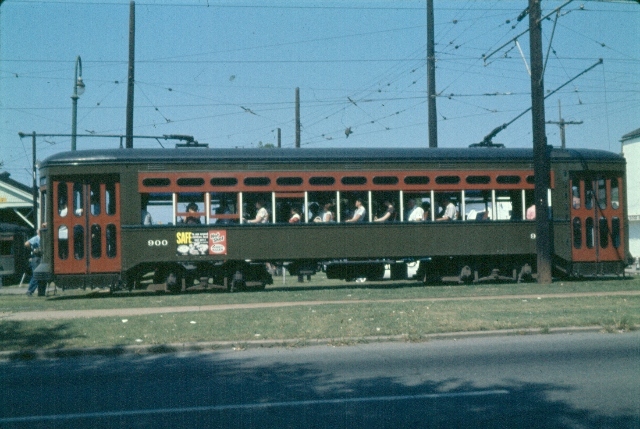 The “have exact fare” reminder disappeared from the dash, and circa 1936 roofs of many Perley A. Thomas cars were painted a light color, perhaps aluminum or very light grey, with a black “V” painted at each end under the trolley wheel, to hide discoloration from powdered metal from trolley wire & trolley wheel wear. This innovation intended to reduce heat absorption, but curiously abandoned during WW II, and the former dull color for roofs reinstated. During WW II the etched car window in each upper R. H. sash which allowed a car's number to be illuminated, was discontinued. This was the last hold-out of the carbuilders' art which in earlier times saw etched & colored end glass in monitor roofs have routes' names displayed (see S p. 72). A few 900s had door locks, a tiny keyhole on the last panel, rear doors. These are known on some cars in the 940s and 950s, in the later 1940s and early 1950s. No photos are known. The first RB Program was more finding a better design. There were different efforts entailing over a dozen cars, from ca. 1960 to 1964, when a systemwide model was adopted: from SCB 4/10/63 by E. Harper Charlton, Wilbur T. Golson, and Otto A. Goessl. 914, 915 RB Dec. 1961 — Rounded blue tinted bus type standee windows repl. upper sash, new steel doors, cars repainted, no louvres. 937 Same, but not repainted, doors not repl., silver strips & white stauncions. 911, 920 Same oval standees, doors as 914. No ventilators but 5 louvres in letterboard. P - S p. 158. 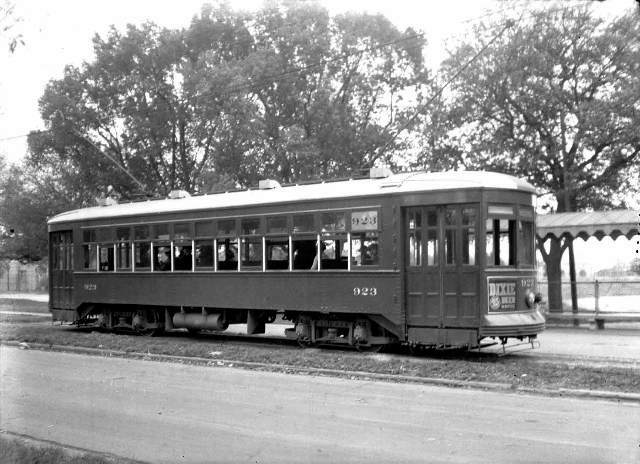 959 First St. Charles car to be RB, like 937 but with aluminum roof only (EWH). 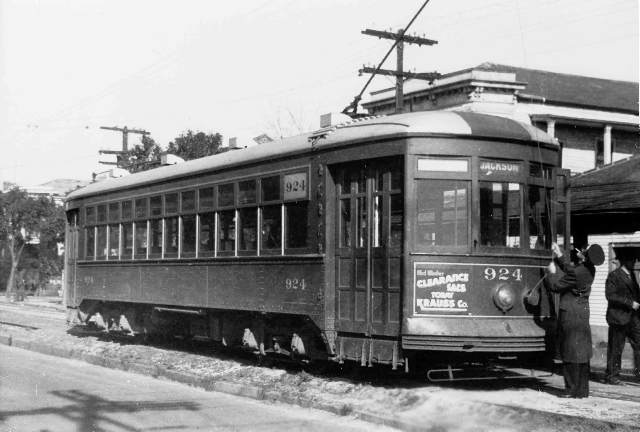 900, 922 Aluminum roofs, trolley coach poles, larger door windows than 911, 914, 920. 900 first w/o ventilators. 932 Like 922 except larger upper sash, no tint. Motors RB, new wheels. 948, 968, 971 Like 932 except conductor's stand & door handles chrome plated. 906 Like 968 except no RB motors, no new rewiring. 907 Same except air door handles not chrome plated. 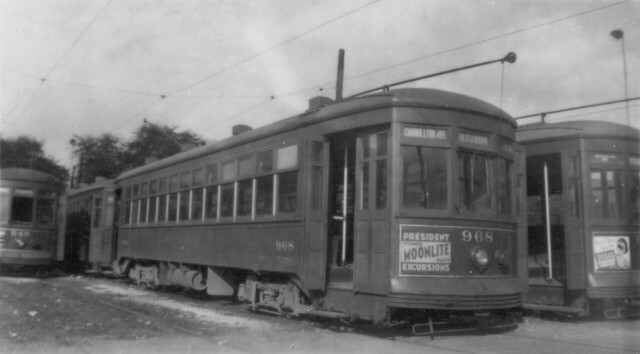 965, 969 Undergoing RB at Carrollton Station at the time. 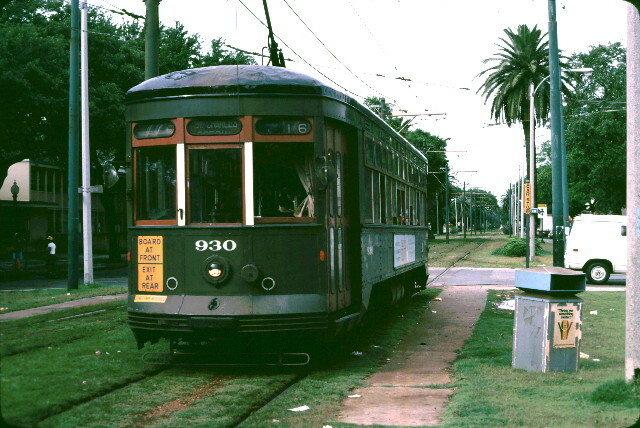 The second RB Adopted 1963, well under way in 1964 for the 35 900s retained for service on the St. Charles Line. P - S p. 157. Trucks RB with new solid WH to reduce noise. All cars - aluminum roof. Segregation signs gone ca. 1957-58. The brass fittings on upper edge seat backs to hold the signs slowly disappeared as seats were renewed. Even the old controller handle wooden knobs repl. by substitute hard black substance. 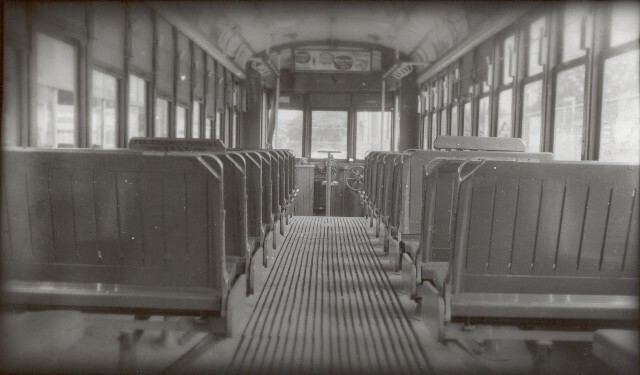 Cars 947-972, except for 954, had electric foot pedals for ringing fares, and the rest of the 35 cars had manual system. It was said, the older conductors got cars with the elec. pedals. One exception to the 900-945 group: 914 had elec. foot pedals. Doors had a subtle color change - to “seminole brown” - interior a light blue, but ceilings - white preferred (blue ceilings only a short time). 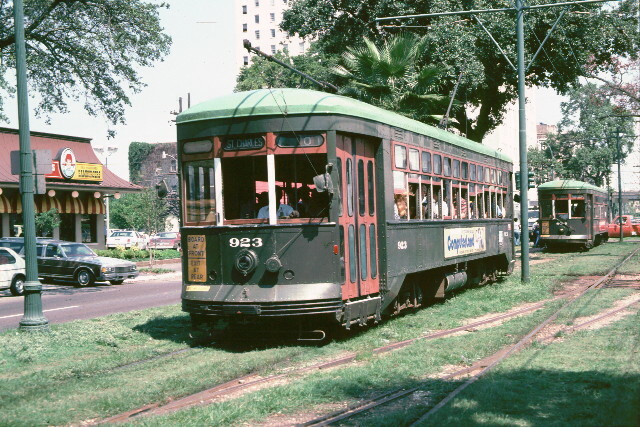 The third RB By 1967, NOPSI realized the St. Charles Line was going to be around for a longer time than imagined. All 35 cars over a couple of years again RB, looking like 2nd RB, with any structural features RB where needed. First two cars; 900 with all aluminum windows, 933 keeping wooden windows. Next 903-907, and afterwards no order. Interior, final change from “deep blue & powder blue ceiling” to lime green with white ceiling (green paint more economical). Text copyright © 2008 Louis C. Hennick. Pictures copyright © 2011 by the persons credited. Picture captions copyright © 2011 H. George Friedman, Jr. and Louis C. Hennick. All rights reserved.